Here is an article telling us that the housework war should be over already because a) men are doing just as much work as women now, b) so, women need to quit complaining and get over it, and c) men need a bit more gratitude from women for their contributions. Funny that. Funny that you can be told the work is being split evenly in the same breath that you are being told that there is just this little bit of extra work assigned only to you. The task of gratitude, get to it lady. 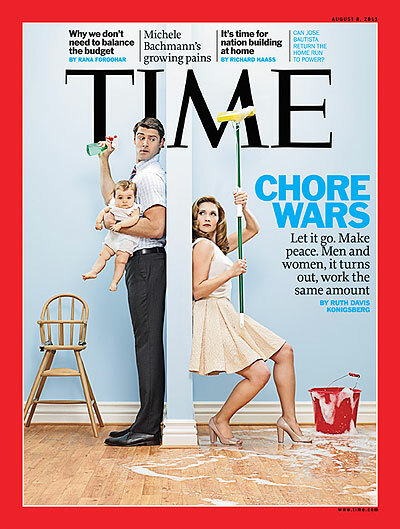 The article, “Why Men and Women Should End the Chore War” by Ruth Davis Konigsberg really overplays its hand on a couple of areas of work and family data. So a year and a half into a new decade, it may come as a surprise to you, as it did to me, to discover that on balance, husbands and wives have never before had such similar workloads. According to data just released by the U.S. Bureau of Labor Statistics, men and women in 2010 who were married, childless and working full time (defined by the BLS as more than 35 hours a week) had combined daily totals of paid and unpaid work — which is to say, work at the office and all the drudgery you have to do at home — that were almost exactly the same: 8 hr. 11 min. for men, 8 hr. 3 min. for women. Looking at married men and women without children (everything is very heteronormative from here on out, sorry) is not a great way to tell the story of the ‘work and family’ juggling act. Yes, of course these couples have family responsibilities, and yes, some will also have caring responsibilities (eg. elder care), but they’re not the ideal category for drawing big conclusions about how ‘work and family’ tasks are being balanced. Because as many mothers will tell you, their relationships were in most ways a lot more equal before children came along. For those who had children under the age of 18, women employed full time did just 20 min. more of combined paid and unpaid work than men did, the smallest difference ever reported. No, men were not doing the same amount of housework as women, but neither were women pulling the same number of hours at the office as men. No, the real question is how are the visible, income-earning hours of work divided between the couple with respect to the invisible, unpaid hours of work? Who is doing more of which type of work? The long-term disadvantage in specialising in unpaid work is significant – if you do more of the unpaid work and your partner does more of the paid work what happens in the event of a divorce? What happens to your retirement savings as an individual? What happens to your ability to win a promotion when and if you re-focus back on your career? Can you ever catch up to your partner’s earning power and if you can’t, can your career ever be prioritised over his career in the relationship? You can be very happy as a stay-at-home mother, you can love the job and find the pursuit intensely satisfying, you can even have actively negotiated for that choice yourself but this doesn’t stop stay-at-home mothers as a group from facing various long-term vulnerabilities. And conversely, being the partner who does all the paid work gives that person a certain leverage in the relationship that shouldn’t be overlooked in any discussion of The Chore War. Note the question being answered here and the one that isn’t. Men say they are finding it more difficult to juggle the dual responsibilities of work and family, but are they actually doing more of the juggling – are they managing more family responsibilities? What these new findings mean is that the widespread belief that working mothers have it the worst — a belief that engenders an enormous amount of conflict between spouses — is simply not the open-and-shut case it once was. Quantitatively speaking, we have no grounds to stand on. And it’s time that women — myself included — admit it and move on. That’s a hell of an admonishment for women, with little data to support the case. Men are doing a lot of child care too — an average of 53 min. a day in 2010 for children under 18, which is almost three times as much as they did in 1965. Working women are doing an average of 1 hr. 10 min. a day, which is only 17 more min., but the compulsory aspect of it may contribute to the feeling of being more time-poor. And why do articles like this one expect us to celebrate equality before we have actually reached it? Why are working women expected to celebrate a result that still has us two hours a week behind fathers? Can’t working women save their joyous fist pumps for the time when our male partners are doing the same amount of caring work as us, or even, when full-time working men are doing two hours more child care than their full-time working partners? The group that has benefited the most from women’s entering the workforce is, ironically, stay-at-home mothers, whose husbands are doing more child care as a result of the larger cultural shift toward involved fatherhood and who now stand out as uniquely low in their total workload. Admirable that this article counts unpaid work, not so great that it systematically ignores the threat to status and security one faces in doing the unpaid work. Because what kind of benefit is it when your job doesn’t even exist in most measurements of productivity? Exactly what is being counted when we say women and men do similar amounts of housework? Any time an article talks about the division of labour in a family here are a couple of questions to be asked. Who does the majority of the ‘outside chores’ and who does the ‘inside chores’? Because there’s a lot less ‘outside chores’ and they tend to be the kind that get undone a lot less quickly than the ‘inside chores’. Paint the wall and it won’t need painting again for another five to ten years, mop the floors and they’ll need doing again tomorrow. Are the chores women do able to be put off until later, to be organised at a time more convenient to the woman? For instance, fixing the gate or mowing the lawn can be done any time over the next two weeks, making dinner and bathing the children have to be done right now, this very second. It doesn’t matter how tired you are, how much work you had to bring home with you, how bad your headache is and how much you just want to sit down for ten minutes and watch the evening news, kids need feeding. That kind of pressure counts in the workload. Are men and women equally sharing the work of organising all this stuff? The work of organising often doesn’t get counted in these surveys because a lot of it goes on inside someone’s head, but it’s bloody taxing work. Walking someone through all the steps in preparing a meal, making sure you haven’t run out of laundry powder for when it’s their turn to do the laundry, writing the shopping list for them and describing where on the aisles they will find the items they need to buy.. all draining work. Are ‘social and psychological chores’ being counted in the survey? Making sure the family meets its social obligations and remains connected to its community is work – were birthday presents bought for children’s parties, did the mother-in-law get a phone call to wish her well in surgery tomorrow? Who is keeping an eye on how well the children are adjusting to the new school? Who went to the parent-teacher interviews? Who worries about whether it is time to see the pediatrician about the younger child’s night terrors? And finally, what does ‘free time’ look like for each partner? One thing the article does acknowledge well are the gender differences in leisure, not only do women get less of it but the quality of their leisure time is worse. Researchers are also discovering differences in how men and women experience time, especially free time. Liana Sayer, a sociologist at Ohio State University, and Marybeth Mattingly, now at the University of New Hampshire, found that whereas in 1975 free time reduced feelings of being rushed for men and women alike, by 1998 it no longer reduced time pressure for women. Not only do women report having less free time than men now, but also the quality of that free time has worsened. “We suspect that it has to do with shifts in how women are spending their free time, which is increasingly devoted to a blend of child care and leisure activities,” says Sayer, who notes that this leads to leisure’s being “contaminated” by less pleasurable activities or “fragmented” by interruptions — when you’re reading on the couch, say, and get called away every 15 minutes to referee a squabble or find a missing Lego piece or administer a snack. According to the University of Maryland’s time-diary studies — which, unlike the BLS’s, collected data on tasks occurring simultaneously — in 1975, mothers combined 25% of their child-care activities with leisure activities. By 1998, that had risen to 50%. And even the most dedicated mother would probably admit that there’s a qualitative difference between having an adults-only meal with friends and going out for pizza with those same friends and a bunch of kids. The gender inequity that persists, then, is in access to high-quality leisure time, which, for whatever reasons, men seem more able to claim — and protect from contamination — than women. The obvious cost of this leisure deficit is that women have less opportunity to relax in a way that recharges their batteries. There is an interesting story here in this article. Men are under strain – they have it harder than previous generations of fathers, they are attempting a huge shift in roles and they’re finding it difficult. But this is not the story of how everything is pretty equal now and mothers should stop banging on about how tired they are and instead pat men on the back a little more. (After I wrote this piece I noticed Ms Magazine has also covered it, really well and from a fairly similar angle to my own post). There’s something deeply hinky about those statistics. 53 minutes of childcare a day for men, and 70 minutes for women? So even if the partners are looking after all the children at a time rather than splitting them, that only comes to two hours and three minutes of childcare per day. Do they all have live-in nannies? Are they only counting direct hands-on childcare, for example, changing a nappy or breastfeeding or reading bedtime stories? It doesn’t add up. I think one of the most telling ways to examine gendered care labour (well, aside from “Who retires poor?”) is to look at what happens when someone is sick. Who looks after a sick child who can’t go to daycare on a day when both parents are supposed to be working? What happens when a father is sick, compared to when a mother is sick? The mothers here will all, I think, know about dragging themselves around caring for a child or children while ill themselves, unable to take a day or three off, or sometimes even an hour. Some working fathers might take a day off work themselves to care for children when their partners are ill and need a day in bed – but I’d be very surprised if that’s routine, or considered “valid” by many workplaces. One aspect that gets lost in nearly all of these discussions is the quality of the relationship a parent has with a child, especially when it comes to what the father misses out on. If you spend more time on your career you get better career prospects, if you spend more time with your child, your relationship with your child is better. Its not just a straight out financial calculation. I used to spend a lot more time than my ex on paid work – prior to us having a baby I earned about twice as much as she did on an hourly basis so it made financial sense for the family for me to spend more time in paid work than my wife. I worked part time but every day I didn’t do paid work meant she would have to spend 2 days on paid work to make up for it. However I now have 50/50 shared care of my 3yr old and have a *much* better relationship with my daughter since separating from my wife. I’m financially worse off but its definitely worth it. I wonder if more men really knew what they were missing out on whether they would push in the relationship for spending less time on paid work, more on childcare, and their partners to do the reverse. I look back at the first couple of years of my daughter’s life and wish that the balance had been a lot more equal even if it meant as a family we would have been financially worse off. lauredhel – I’d agree those numbers seem a bit low, but perhaps its because they are averages for families where the child’s age may vary from 0-17. I don’t have a 17 year old around, but I would guess that they normally require a lot less hands on time? Certainly for a 0-3 year old (the age that I have direct experience) they soak up a lot more time than that even if in childcare during working hours. It seems to me they need to add a category for being the “responsible adult in charge” in addition to whatever they are counting as childcare. Someone needs to be home when the kids are, answer questions about dinner/the universe/the weekend, check if homework is getting done, and generally insure they don’t burn the house down or kill each other. For goodness sake, its common to get an allowance (from an employer) if you’re required to be on call, in recognition of the altered quality of your time and options, so surely we can recognise it here? Keira, an on-call allowance sounds like it should be something built in to all family time/work negotiations. Re. calculating childcare, I guess the more kids grow up, the more your caring for them get incorporated into other categories of household work. That is, you’re still buying their clothes, feeding them, doing their washing, but it gets called shopping/cooking/laundry instead of childcare, and the difference between doing those things for one or two people and doing them for four or five people is not calculated. It’s also reinforcing that old gendered divide between private and public. The outside work is visible and so more likely to be recognised and acknowledged. It’s also just more pleasant to be outside mowing the lawn than inside breaking your back cleaning the encrusted urine out of the toilet seat hinge. The more embiggened your economic status, the more power you have to negotiate what domestic work you do, if any. Which is should be, because it is enormous, especially with teenagers who require more or less constant shovelling-in-of-victuals, who tend to produce large swathes of rather smelly clothes, and who, in my experience, can (not will, but can) even at age 18 be astonishingly thoughtless and do ignorantly dangerous things around the house. And even if your kids are old enough to slap together a meal and wash the dishes sometimes, even do a load of laundry, who plans the weekly meal plan? Who keeps track of their allergies and works around them? Who shops for food and puts it away? Who takes care of inventory? Who cleans the washing machine, checks the weather forecast for whether the clothes will dry on the line, who does the proper kitchen cleaning? Who shops for plates, kitchenware, pegs, laundry detergent, cleaning gear, tea towels, and ensured there is planned storage for all of the necessaries? Who plans and deals with school and school supplies and uniforms and homework? Who sits up at night and worries the first time their kid is out at night with the new friend(s) they met last week? lauredhel – I agree with you that the data didn’t make intuitive sense. I couldn’t get a copy of the study but I spent quite a bit of time investigating the BLS stats to see how they collect and interpret their data. Australia has some of the best methodology around, and the US data is good but not great.. Somehow it feels to me like some of women’s work is going missing in the data – because the results just don’t match the vast majority of households I know in Anglo Saxon countries. Their methodology does allow multiple functions to be recorded in the diaries at once, but I wonder if organisational work and psychological work, which is gender-based work, is going missing in their collection methods. The article is like a kind of gaslighting.